My instructions, simple enough, were spelled out in permanent black marker on the cover of a brown pizza delivery box: Lay six chicken breasts down one side of a parchment-covered baking sheet pan, lay four across, then fill all the spaces in between. The precise pattern, altered only by the quantity of pieces involved, held for thighs, drumsticks and wings, all of which–1,400 pounds worth–had been marinating over the weekend in a teriyaki-flavored brine. If all went well, the final product–roasted teriyaki chicken–would be ready three days hence, to be served as lunch to some 2,350 children in all 16 of Berkeley, California’s, schools. I would spend the next several hours “panning up” this mountain of chicken, preparing it for its destiny in a bank of convection ovens in the district’s central cooking facility at Martin Luther King Jr. Middle School. This was my first assignment after offering my services as galley slave in exchange for a one-week, first-hand look at how Berkeley schools accomplished a switch from the typical school diet of frozen, industrially-processed convenience foods to cooking fresh meals from scratch. There was much more to come. Earlier this year, I spent a similar week in the kitchen of my daughter’s elementary school here in the District of Columbia to witness food being “fresh cooked,” only to learn that most of what was being fed to my daughter and her student cohorts across the city was the same frozen, pre-cooked convenience food that Berkeley used to serve, but had rejected–the same chicken nuggets and tater tots that riveted millions of television viewers when Jamie Oliver exposed them on his recent “Food Revolution” series. There are some resemblances between the Tyson chicken nuggets the kids eat at H.D. 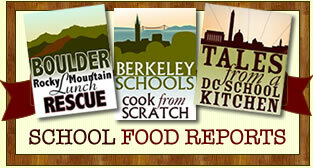 Cooke Elementary School in D.C. and the teriyaki chicken being served in Berkeley schools. Both, of course, start as real chicken. Both are also “government commodity” chicken, meaning “surplus” the federal government purchases from giant chicken feedlots and donates to the federally-subsidized school meals program. But that’s pretty much where the similarities end. The Tyson nuggets are really extrusions and amalgamations of all sorts of chicken bits, seasoned with a dose of salt and chemical additives. Factory machines shape the mix into kid-size bundles that are breaded and baked assembly-line style, then shipped frozen hundreds of miles to school kitchens. Low-skilled workers pour the frozen nuggets out of plastic bags onto sheet pans and quickly re-heat them. A few minutes in a 350-degree oven is all it takes before the factory nuggets are ready to be displayed on the food service line where hungry kids scoop them up. The chicken in Berkeley schools also arrives frozen, in big bricks of chicken parts known as “eight-cut” chicken, meaning the chicken carcass has been cut in half, then into breasts, legs, thighs and wings–eight pieces per bird. But no further processing has been done. The skin is still on the meat, the meat still on the bone. It looks very much like the chicken you would find in the meat aisle of the grocery store if you were looking for an economical cut of poultry for dinner. The chicken typically arrives on Wednesday in plain brown cardboard boxes: Insiders call raw commodity ingredients “brown box” food. The birds take two full days to thaw. Then the parts are separated, placed in big plastic tubs called “Lexans,” and covered with a brine to rest in the central kitchen’s refrigerated meat locker over the weekend. In this case, the teriyaki brine is a carefully measured mix of soy sauce from five-gallon containers, sherry vinegar, sesame oil, fresh garlic and ginger, and orange juice. A simple syrup of brown sugar and water is poured over the whole thing until the chicken is completely covered and the Lexan weighs about 200 pounds. In other words, by the time I got to these huge tubs of chicken on Monday, the chicken had already been in process five days with the intervention of several kitchen workers–separating the chicken, peeling and chopping ginger, chopping garlic, mixing the brine, moving the chicken in and out of walk-in refrigerators. Over the ensuing three days it would require further intervention: the chicken pieces would be drained and organized on sheet pans, brushed with another teriyaki glaze, roasted to a precise 160 degrees internal temperature. The cooked chicken would spend yet another night in a refrigerator before being wrapped, labeled and trucked to outlying schools, and finally re-warmed and served in lunch lines all over town. Truly, this was an epic chicken and perfectly illustrated the difference between the frozen convenience foods served in most public schools and the food cooked from scratch in the Berkeley Unified School District. It was a lot of work. The joke in school food circles these days is that the most important tool in modern school kitchens has become the box cutter, to remove all those frozen, pre-cooked meal components like chicken nuggets and tater tos from their shipping containers. 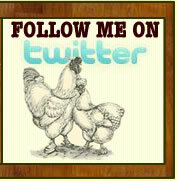 Epic chicken represents the polar opposite, a huge investment in time, labor and attention around the concept of cooking food on a large scale from fresh, raw ingredients. One style of feeding children is easy and requires hardly any skill at all. That’s a big savings on labor. The Berkeley method saves on some ingredients, but definitely costs more in human effort. But in D.C., school food services currently runs a deficit of more than $5 million every year (the red ink was double that before the District hired Chartwells-Thompson, a huge food service corporation, to take over school meals here.) The average U.S. school food program, according to the School Nutrition Association, operates in the red to the tune of 35 cents per meal. In Berkeley, meanwhile, food services not only don’t lose money, they are making a profit for the first time since 2001, five years after switching to cooking from scratch. Still, some skeptics might ask: Why go to all that trouble? Why spend eight days making chicken for just one meal? Kids seem to be just as happy eating processed convenience foods, argue many food service directors. Why not just give them what they want? Indeed, it was precisely this question that I came to Berkeley to answer, because it was here that Alice Waters, the fairy godmother of cooking fresh food from local, seasonal ingredients, made her imprint on the public school cafeteria. Her influence continues to reverberate around the country, inspiring school districts, farm to school programs, even first lady and White House gardener-in-chief Michelle Obama. But in case you thought the Berkeley school menu was just a copy of the one at Waters’ internationally famous restaurant–Chez Panisse–located just a few blocks from the central school kitchen, you need to check those inclinations fast. As I quickly learned, kid preferences exert an enormous influence even in schools where food is fresh-cooked, because Berkeley schools still depend on subsidies from the federal government. Like every other school in the federal meals program, they need to “sell” as much of that epic chicken as possible. Each student who qualifies for a free lunch and takes the chicken earns the school district a $2.68 payment from Uncle Sam. Thus, at Martin Luther King Jr. Middle School you will see pizza on the menu twice a week, Monday and Friday. Pizza is, hands down, the favorite food of school children nationwide. In most schools, kids get a reheated frozen pizza made in a factory with a ton of industrial additives. In Berkeley the pizza is made in the central kitchen using a whole wheat crust, real mozzarella cheese, marinara sauce made with freshly chopped onion, celery and carrots. And instead of being topped with frozen, factory-made pepperoni, as in my daughter’s school in D.C., here it’s fixed with turkey sausage also made from scratch using whole turkey and seasonings. One variety of Berkeley pizza even comes with pesto. Nachos are served every Friday. But they are not the ones you see at other schools–fried chips doused with processed orange cheese. The Berkeley nachos start with baked corn chips, but forget about the Dayglo cheese. Instead there’s a meat mix of beef, turkey and soy protein, accompanied by a side of freshly cooked brown rice and re-fried beans. Tacos, also with brown rice and beans, are served every Monday as an alternative to the pizza. And there’s plenty of pasta to be eaten over the course of a week, but Berkeley pasta involves freshly grated cheeses and sauces that start with home-made vegetable stock, just like in a first-class restaurant. Alice Waters might cringe at the way her food rules have been bent to accommodate juvenile tastes. But executive chef Bonnie Christensen says her menu addresses the main concern of Berkeley parents who lobbied for the change. They were appalled by the frozen processed foods being served in school loaded with fat, salt and sugar. They did not want their children exposed to coporate, brand-name products laced with additives. They wanted their children to learn to eat fresh-cooked meals. In Berkeley, there are no sugary desserts served, no “a la carte” lines with ice cream sandwiches and corn dogs. You also will not see the flavored milks that are rampant in D.C. schools, sweetened with high-fructose corn syrup to the level of Classic Coke or Moutain Dew. In Berkeley, kids at lunch have a choice of water, iced tea (for middle and high school) or plain organic milk. To save money, and reduce the waste of milk cartons, kids serve themselves from milk dispensers using re-usable plastic cups. And, in accordance with Alice Water’s dictum that all meals should be shared and savored in pleasant surroundings, kids at Martin Luther King Jr. Middle School eat their epic chicken in a spa-like hall called the “dining commons.” The building overlooks an asphalt playground, but its vaulted ceilings braced with rough-hewn wooden beams, the tables and chairs hand-crafted from recycled oak and walnut, suggest it would be perfectly at home in more rustic surroundings–say, Yosemite National Park. It was here that I reported for duty at 5:30 a.m. on a recent Monday. A bright, full moon hung over San Francsico Bay, and from the playground a grand vista opened through a break in the tree line: a wind-blown chop on the bay waters, the hills above Sausalito silhouetted on the horizon, and there in the distance hundreds of twinkling pinpoints of light–like a string of tiny, orange pearls–outlining the Golden Gate Bridge. I wasn’t quite sure what to expect when I walked through the kitchen doors. Sous chef Joan Gallagher seemed startled to see me. When I explained who I was, she led me through a kitchen the size of a basketball court to a big kettle cooker, where executive chef Christensen was getting ready to cook pasta. “You must be the new intern,” she said. Intern? I looked around to see if there was someone behind me. Nope. “Intern” was my official designation during the week Iwas embedded in Berkeley’s central kitchen. Gallagher handed me a black apron, a pair of latex gloves and a hair net. Yes, I would have to wear a hair net (I later walked two miles to the bookstore at U.C. Berkeley to purchase a baseball cap.) Then Gallagher showed me to the meat room and explained how to remove the raw chicken from the teriyaki brine; how to drain it in a perforated, plastic Lexan that fit perfectly into the room’s big, stainless sink; how to arrange the pieces on the parchment-covered sheet pans. When fully loaded, the sheet pans were inserted into an aluminum rack on wheels, the rack covered with a big, translucent plastic bag, then the whole thing was wheeled into a refrigerator pending the next step in the process. Later that morning I was joined by a kitchen employee named Renell. Now I focused on draining the chicken and he arranged it on the sheet pans. Renell is a kind of utility player in the Berkeley food service scheme. He goes wherever one of the district’s outlying schools–or the central kitchen–might have a need on any given day. On this particular Monday, supervisors were scrambling because seven of the 30-odd kitchen workers in the system had not shown up. Later, three of the food servers at MLK would be dispatched to other schools to help out in the lunch lines. After we’d exchanged pleasantries, I asked Renell what he thought about all this cooked-from-scratch food he was helping to make. Well, that’s one man’s opinion. Dismal though it might sound, it’s shared by a great many food service directors all over the country. But not in Berkeley. At 10 a.m., I and the rest of the kitchen crew broke for our daily “family” meal. This consisted of tacos from the Friday before, along with a fresh salad: romaine lettuce with hard-boiled egg, sliced carrots, sliced radishes and a selection of dressings. The meat mixture served with the tacos has a kind of cellulosic aspect, because of the soy protein that’s mixed in with the ground beef and turkey. But I noticed that my new kitchen companions helped themselves to big piles of it. Then it was back to “panning up” chicken, the toughest part being the wings, which need to be tightly folded so that the tips are not exposed and do not burn while roasting. Over the course of the week, I would come back to these same pans of chicken. After the huge breasts were cooked in a special steam-roaster to keep them moist they needed to be sliced in half to make kid-size portions. I would wrap and label the cooked chicken for delivery. I would weigh and wrap stainless pans of pasta. I would help seal kiddie meals for the district’s day care centers on an assembly machine that mimicked the chocolate factory scene in I Love Lucy. I would count bags of corn chips for chilaquiles, pack breakfast bins, and every morning at 11:25, I would take my position at one of the serving stations and brace for the first of three waves of several hundred kids hungry for lunch. It was there each day that I came eyeball-to-eyeball with the question that is so vexing authorities concerned with children’s health and especially how school meals might be implicated in an epidemic of obesity: What will kids eat? Next: Parents revolt against processed foods. It’s great to hear that the Berkeley “experiment” continues beyond the reign of the Renegade Lunch Lady, Chef Ann Cooper. Her job was to transform this program and pass it on to a new manager. Then to read that the program is actually in the black! 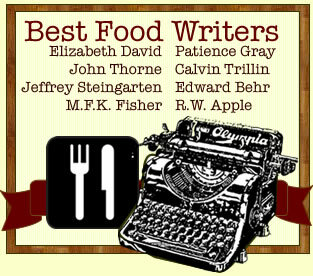 I look forward to your next installment and the big question – are the kids eating the new food? Very, very interesting. I am also interested to hear more about how the greater labor needs are paid for. Do they have more or different revenue sources? Thanks! Looks better than the chicken in another Berkeley County school I know of. I wish our kids in Mechanicsville, VA could try the teriyaki chicken and fresh pizza. No such luck here…yet….